World Health Organization (WHO) describes depression as a major, worldwide cause of disability and labels it as an important public health challenge in low and middle income countries. The proportion of the global population with depression in 2015 is estimated to be 4.4% which affects approximately 322 million people. Prevalence rates vary by age, peaking in older adulthood (above 7.5% among females and above 5.5% among males). In India, prevalence of depression was estimated to be 4.5% in the year 2015, which is estimated to be about 57 million people. Life expectancy in India has increased from 45 years in 1970 to 66.2 years in 2012. On account of improved life expectancy, better education and health facilities, the proportion of the geriatric population has gone up from 5.3% in 1971 to 8.6% in 2011. An increasing geriatric population is expected to increase burden of depression since prevalence of depression peaks in older adults. Geriatric people comprise a particularly vulnerable group as they usually have multiple co-existing medical and psychological problems. Depression adversely affects functional status, quality of life and contributes to premature deaths. Given the relative ease of diagnosing depression and availability of effective treatments, there is enormous potential for alleviating this largely untreated or undertreated public health burden among geriatric people., Most of the Indian elderly live in the rural areas and urban slums where the access to the health care facilities is meagre and there is paucity of community based studies assessing depression among elderly in India. Considering the aforesaid facts, the present study was conducted in rural and urban slum areas to determine the prevalence of depression and its epidemiological correlates among geriatric people residing in southern Haryana, India. This community based study with cross-sectional design, was conducted during November 2017 to March 2018 after obtaining approval from the Institutional Ethics Committee. The study was conducted in the area catered by Primary Health Centre (PHC), Nagina and Community Health Centre, Nuh of district Nuh of Haryana State (India). PHC, Nagina and CHC, Nuh are respectively rural and urban field practice areas of Department of Community Medicine, SHKM Govt. Medical College, Nalhar. The sample size of 308 elderly subjects was calculated using the formula for cross-sectional studies (N = Z21-α/2 P (1-P)/D2). The Z is value of area under two tailed normal curve and α, level of significance was taken as 0.05. The ‘P’ was prevalence (14.4%), and ‘D’ was absolute precision (4%). A house wise list of elderly people in the study area was made from the family folders prepared by the Department of Community Medicine. Investigator contacted elderly persons through house to house visit till the desired sample was reached. A total of 308 elderly persons i.e. 154 each from urban and rural field practice area participated in the study. Geriatric people equal to or more than 60 years of age and consented for participation in study, were recruited as study subjects and those having gross communication difficulties such as speech problems, hearing abnormalities and who didn’t consent were excluded from the study. Geriatric people were contacted by investigators through house to house visit. Conversation with elderly was started with general discussion to build the rapport, then informed written consent was obtained. Study subjects were interviewed using a semi-structured questionnaire having two parts. Part 1 was used to collect information regarding socio-demographic profile, chronic morbidity, substance abuse, physical activity, living arrangement and other factors. The socioeconomic status of study population was measured using Udai Pareek scale for rural population and modified Kuppuswamy scale for urban population. Part 2 was consisting of shorter version of the “Yesavage’s Geriatric Depression Scale (GDS-15)” having 15 questions that are simple and clear. Study subjects were screened for depression by using standard Shorter version” (GDS- 15). A valid Hindi language version of Geriatric Depression Scale-30 was readily available  and Hindi version of GDS- 15 was developed from it. The participants were asked to respond questions by answering ‘yes’ or ‘no’ in reference to how they felt over the last one week. Each negative answer was given 1 point and thus, the more the scores will be, the more will be the chances of having depression. A score of > 5 i.e. Score 6-15 is suggestive of depression. Every study subject, found positive for depression, was referred to the Psychiatry Outpatient Department of SHKM Govt. Medical College, Nalhar at the earliest for appropriate management. Elderly: Elderly refers to the individuals with age 60 years or above. Age of study participants was verified by Aadhaar card or any other government issued Identity Card. Physically Activeness/Inactiveness: Elderly were labelled ‘physically active’ if they were involved in farming/labor or could do household work regularly. A study participant was taken as ‘physically inactive’ if he/she was able to perform the activities of daily living on his/her own, but not involved in any occupation or household work regularly. An elderly was labelled ‘dependent on others for the day to day activities’ if he/she needed help of others for activities of daily living. Economic Dependence/Independence: Elderly were considered ‘economically independent’ if their life is economically productive; ‘Partially Dependent if they had very less income like old age pension; and ‘Totally Dependent if they were not having any income. Engagement in work/hobbies: Refers to time spent by elderly persons by doing household work, occupation, or hobbies like playing with grandchildren and attending community gatherings etc. Chronic morbidity: It was considered present among elderly those who were known cases of hypertension or any other cardio-vascular diseases, diabetes mellitus, arthritis, respiratory diseases, stroke, carcinoma or any illness of more than six months’ duration. The data were analyzed using IBM Statistical Package for Social Sciences for Windows (Version 20.0). The Pearson’s Chi-square test at significance level of 5% was used for categorical variables. Categorical variables were presented as proportions (%) and variables with quantitative data were presented as mean and standard deviation (SD). Stepwise multiple logistic regression was used to find out an independent factors associated with depression, its outputs were presented as Odds Ratio (OR) with 95% Confidence Interval (CI). A total of 308 elderly persons belonging to rural and urban areas participated in our study. The mean age of study subjects was 67.4 years (SD=7.25). Of the total, 51.2% of study participants belonged to lower class, 39.9% lower middle and 9.9% middle class. Most of the elderly (76.6%) were illiterate, 15.3% persons studied below primary and only 8.1% elderly were educated above primary. Prevalence of depression (GDS score >5) among the elderly population in the present study was found to be 22.72% (95% CI: 18.2-27.8). 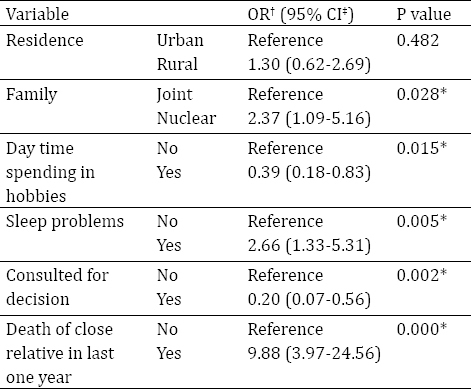 [Table 1] shows that the prevalence of depression increased with increasing age and was significantly higher among rural, nuclear family residents and those who were living alone (widowed/separated). Significantly high prevalence of depression was found among elderly with sleep problem, lack of day time spending in hobbies, lack of physical activity, dependency on others for day to day activity, chronic morbidity, and lack of consultation for decisions and death of the close relative. Depression was not significantly associated with the factors like gender of the participants, socio-economic status, literacy level and substance abuse. On applying multiple logistic regression model, nuclear family, sleep problems and death of close relative in last one year were found to be the independent predictors of depression. Factors like, spending daytime in activities and consultation for decisions were found to have strong protective effect in depression among elderly [Table 2]. Rural residence was not found to have a significant effect on depression in the multivariate analysis though it was significantly associated with depression on bivariate analysis. Depression in later life is associated with disability, increased mortality, and poorer outcomes from physical illness. Considering the gravity of depression among elderly population as explained in various literature, this community based cross sectional study has been planned to extrapolate the burden of this psychological malady of depression among elderly population of field practice areas of department of Community Medicine. In terms of several vital socio-economic parameters, the Nuh district falls way behind other parts of the country, despite being a part of the prosperous state of Haryana. The majority of the district’s population (88%) reside in rural areas. The education statistics reveal that merely 37.6% of females are literate as against 73% literacy rate among males. India has one of the world’s largest population of elderly and it is estimated to be 100 million elderly at present and the number is expected to increase to 323 million, constituting 20 % of the total population, by 2050. In present study prevalence of depression among selected cohort of geriatric sample has been found to be 22.72%. The study findings were consistent with the observations made by Barua A et al from West Bengal and by Pracheth R et al in urban slums of Dharwad district, Karnataka, who had determined the prevalence of depressive disorders in the elderly population to be 21.7% and 29.36% respectively., However, a high prevalence of depressive disorders of was observed by Swarnalatha N et al among rural elderly in Andhra Pradesh (47%) and by Nandi PS et al in the rural West Bengal (52.2%)., SHARE study conducted among elderly with age >50 years from Europe found depression prevalence rate as 18%-37%. Studies have revealed that the prevalence rates vary from 6 to 50% for depression in community samples of elderly in India.,, This wide difference in the figures is mainly due to different sampling strategies, sample sizes, study setting and instruments used in different studies. Depression was more noted among elderly population of rural area compared to urban in our study. This association was contrary to the study done by Sen Gupta et al in which urban elderly had depression more than rural elderly. Increased prevalence among rural persons did not appear to result from rural residence itself, as residence was not independently associated with depression once health and resource factors were held constant. Rather, people in rural areas were more likely to have characteristics that are strongly associated with depression, including poor health status, chronic disease, and poverty. Nuclear family leads to separate living of geriatric people therefore, a decrease in their care and support. On contrary Pilania et al found no association of type of family with depression in their study. This difference of findings may be attributed to difference in sample size and geographical area of study. The incidence rates of depression and anxiety are significantly higher in people with a sleep disorder than those in patients without one. Furthermore, there is a bidirectional connection between insomnia and depression. Insomnia aggravates depression, and depression negatively affects the quality of sleep, creating a vicious circle. In our study depression was found more among those who have sleep problems/lack of sleep (OR=2.36). Similar findings were also reported by Pilania et al and Sengupta et al in their studies. The present study also reported negative significant association between day time spending in hobbies and depression (OR= 0.39). Similar findings were also observed in other studies., Work/hobbies improve the person’s self-esteem and act as distractors for depressive thoughts. Peer group at work place provide support and opportunity to share, which prevents development of depressive symptoms. Consultation of elder people in the major decision of family also does reduce the depression level. Same was noticed in our study with negative significant association between consultation in major decision and depression (OR = 0.20). Almost similar findings were noticed by Pilania et al and Maulik et al., When, elderly members are involved in major decision of family and shown respect by young ones, they do not develop feeling of worthlessness and hopelessness. The present study found that geriatric people living with other comorbidities have more chances of having depression which corroborates the findings reported from a tertiary hospital of Delhi and other studies.,, In fact, relationship between depression and chronic comorbidities is bidirectional. Depression is itself a risk factor for the development of chronic diseases and leads to their poor outcome. On the other hand, chronic diseases may also lead to depression. There is almost 10 times probability of having depression among elderly populations who have lost any of their close relative in last one year. Barua et al, Cole et al and Blazer et al reported bereavement significantly increases the risk of developing depression in the elderly.,, Death of a close relative, especially son or spouse, is devastating in elder people life. After the death of an earning member, geriatric people are forced to face financial problems. There were certain limitations in the present study. Chronic morbidities were either already diagnosed or self-reported only. Therefore, we might have missed certain chronic comorbidities such as undiagnosed hypertension, diabetes etc. Secondly, we didn’t confirm the diagnosis of the elderly found positive for depression with GDS-15. The present study depicted that approximately every fourth elderly person was suffering with depression. Nuclear family, sleep problems, not consulting elderly in major household decision making, chronic morbidity, lack of physical activities, and death of close relatives were identified as major risk factors of depression among geriatric population. World Health Organization. Depression and Other Common Mental Disorders: Global Health Estimates. Geneva: World Health Organization Publications; 2017. [Accessed Jan 28, 2018]. Available from: apps.who.int/iris/bitstream/10665/254610/1/WHO-MSD-MER-2017.2-eng.pdf. UNICEF Statistics, India 2012. All India Report. [Accessed Feb 06, 2018]. Available from: file:///C:/Users/Suraj/Downloads/statistics-india-unicef.pdf. Raja S, Wood SK, de Menil V, Mannarath SC. Mapping mental health finances in Ghana, Uganda, Sri Lanka, India and Lao PDR. Int J Ment Health Syst 2010 May 27; 4:11. Pilania M, Bairwa M, Khurana H, Kumar N. Prevalence and predictors of depression in community-dwelling elderly in rural Haryana, India. Indian J Community Med 2017; 42:138. Radhakrishnan S, Nayeem A. Prevalence of depression among geriatric population in a rural area in Tamilnadu. Int J Nutr Pharmacol Neurol Dis 2013; 3:309-12. Chadha VK. Sample size determination in health studies. NTI Bulletin 2006; 42:55-62. Singh T, Sharma S, Nagesh S. Socio-economic status scales updated for 2017. Int J Res Med Sci 2017; 5:3264-7. Yesavage JA. Geriatric depression scale (short version); Psycho pharmacol Bull 1998; 24:709-11. Indo-US cross national epidemiology study Geriatric depression scale-Hindi version (GDS-H). Available from: http://www. wpic.pitt.edu/research/dementia_epidemiology /IndoUS/Instruments/Geriatric%20Depression%20Scale-Hindi.pdf. [Last accessed on 2018 April 25]. Govt. of India. Ministry of Social Justice and Empowerment Policies/Acts/Rules/codes/circulars. Care of older persons. Concessions and Facilities given to Senior Citizens. Available from: http://socialjustice.nic.in/consd.php. [Last accessed on 2018 Apr 30]. Rodda J, Walker Z, Carter J. Depression in older adults. BMJ 2011. [cited 2018 Sep 3];343:d5219. Available from: http://www.ncbi.nlm.nih.gov/pubmed/21957206. S M Sehgal Foundation. Identifying Backwardness of Mewat Region in Haryana: A Block-Level Analysis 2015. Available from: http://niti.gov.in/writereaddata/files/document _publication/Identifying Backwardness of Mewat Region in Haryana-A Block Level Analysis_final_0.pdf. Barua A, Das A, Nagaraj K, Bhat HV, Nair NS. Depression in elderly: a cross-sectional study in rural south India. JIMSA 2007;20:259- 61. Swarnalatha N. The Prevalence of Depression among the Rural Elderly in Chittoor District, Andhra Pradesh. J Clin Diagn Res 2013;7:1356-60. Nandi PS, Banerjee G, Mukherjee S, Nandi S, Nandi D. A study of psychiatric morbidity in an elderly population in a rural community in West Bengal. Indian J Psychiatry 1997; 39:122-29. Castro-Costa E, Dewey M, Stewart R, Banerjee S, Huppert F, Mendonca-Lima C, et al. Prevalence of depressive symptoms and syndromes in later life in ten European countries: the SHARE study. Br J Psychiatry 2007;191:393-401. Jariwala V, Bansal RK, Patel S, Tamakuwala B. A study of depression among aged in Surat city. National J Community Med 2010; 1(1): 47-9. Rajkumar AP, Thangadurai P, Senthilkumar P, et al. Nature, prevalence and factors associated with depression among the elderly in a rural south Indian community. International Psychogeriatrics 2009; 21: 372-8. Venkoba Rao A. Psychiatry of old age in India. International Review of Psychiatry 1993;5:165-70. Probst JC, Laditka SB, Moore CG, Harun N, Powe MP, Baxley EG. Rural-Urban Differences in Depression Prevalence: Implications for Family Medicine. Health Serv Res 2006;38(9):653-60. Available from: http://www.stfm.org/fmhub/fm2006/October/Janice 653.pdf. Sandhya GI. Geriatric depression and related factors - a cross sectional study from a rural community in South Kerala. J Ind Acad Geriatrics 2010;6:61-3. Maulik S, Dasgupta A. Depression and its determinants in the rural elderly of West Bengal -a cross sectional study. Int J Biol Med Res 2012;3:1299-302. Akhtar H, Khan AM, Vaidhyanathan KV, Chhabra P, Kannan AT. Socio-demographic Predictors of Depression among the Elderly Patients Attending Out Patient Departments of a Tertiary Hospital in North India. Int J Prev Med 2013;4:971-5. 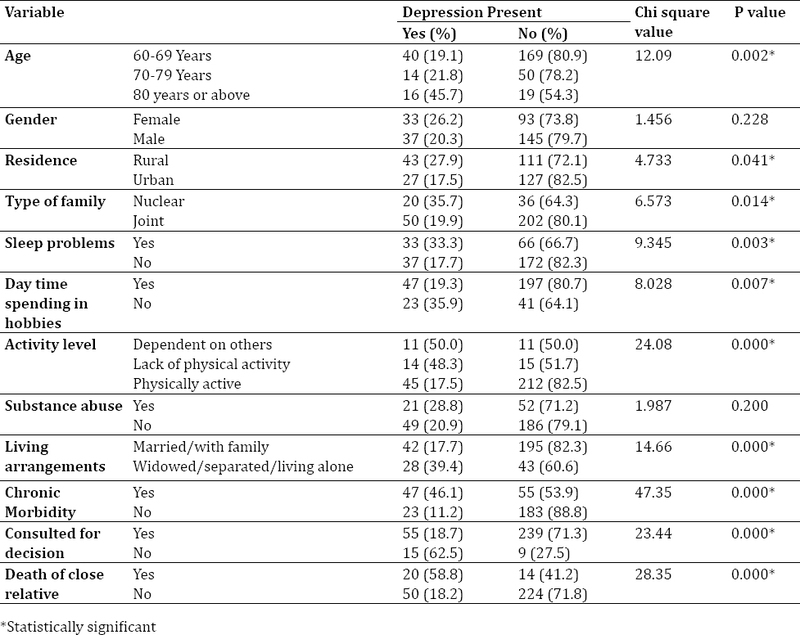 Malhotra R, Chan A, Ostbye T. Prevalence and correlates of clinically significant depressive symptoms among elderly people in Sri Lanka: findings from a national survey. Int Psychogeriatr 2010;227-36. Arslantas D, Ünsal A, Ozbabalık D. Prevalence of depression and associated risk factors among the elderly in Middle Anatolia, Turkey. Geriatr Gerontol Int 2014;14:100-8. Katon WJ. Epidemiology and treatment of depression in patients with chronic medical illness. Dialogues Clin Neurosci 2011;13:7- 23. Blazer DG, 2nd, Hybels CF. Origins of depression in later life. Psychol Med 2005;35:1241-52.